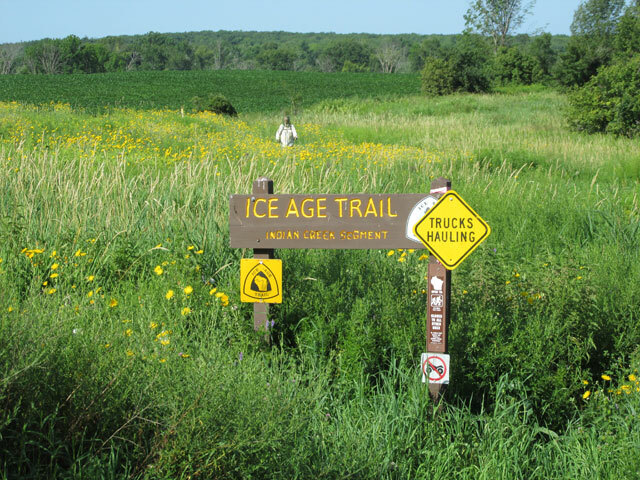 Judy decided that she would like to hike another long trail and chose the Ice Age Trail. 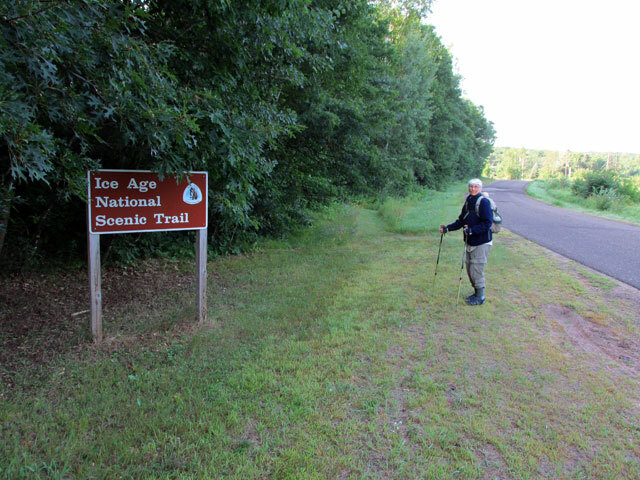 The Ice Age Trail is a National Scenic Trail stretching 1,200 miles in the state of Wisconsin. She wants to spend approx. 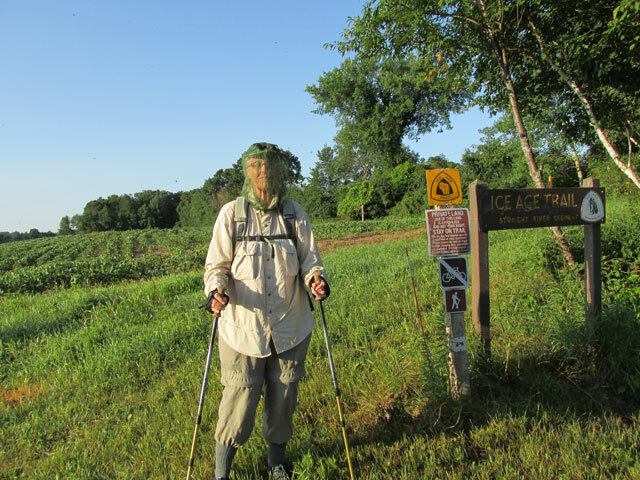 6 weeks hiking half of the total distance. 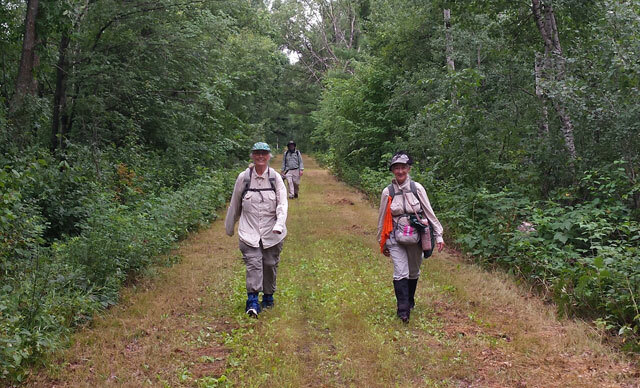 We decided the last of July and all of August would be the best weather, least bugs and before hunting season. We left Virginia on 7/20 and made it a short day by stopping in Beckley, WV so we could have dinner at the restaurant in Tamarack. It's run by the Greenbrier Resort and has excellent food. 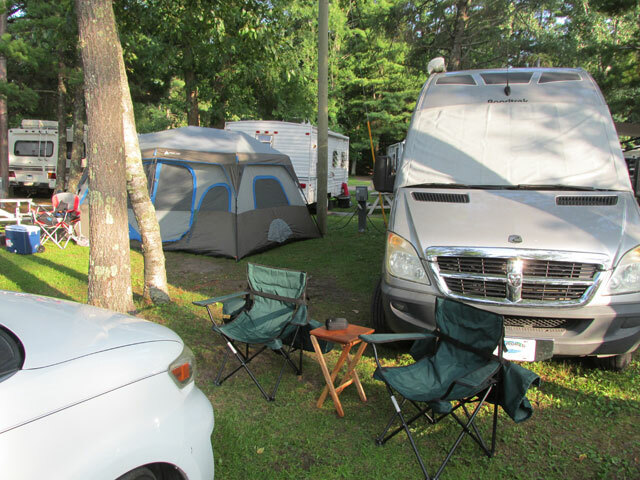 The next 2 nights were outside of Indianapolis and Rockford Ill. We arrived at the Pine Grove Resort near Luck, Wi. on 7/24. It is on Bone Lake and seemed nice when we arrived. I noticed the sites were marked with red paint on the ground and were very narrow. We found out why when the weekend came. Trailers were packed in like sardines. Our awning would have almost been over the tent next door. The neighbor on the other side had to move our picnic table to park his trailer where he wanted. 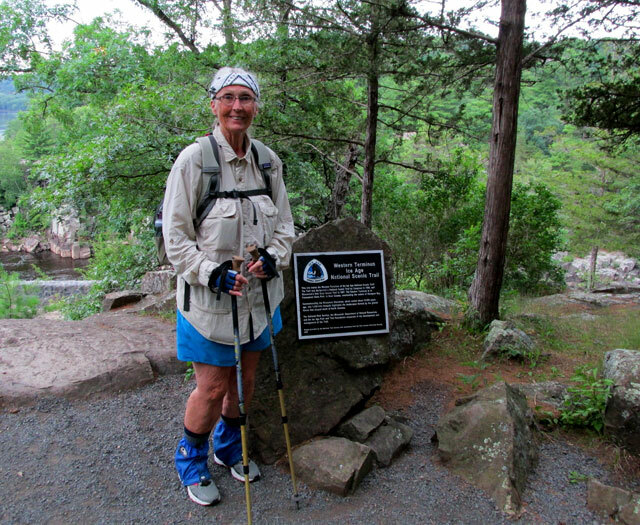 Judy started her hike on 7/25 at the Interstate Park in St. Croix Falls. 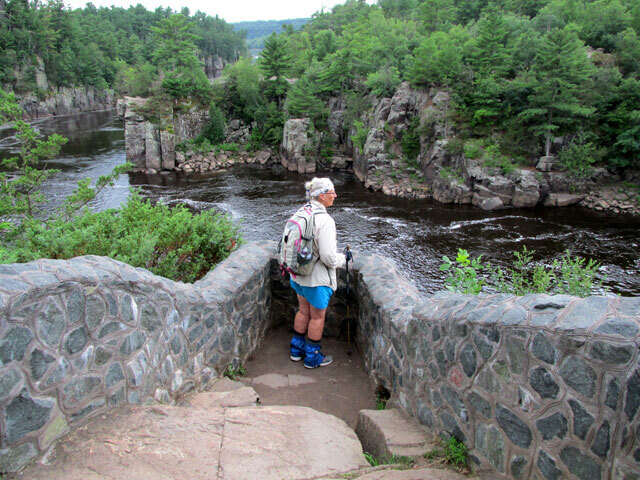 This is Judy checking out the St. Croix River. That's Minnesota on the other side. 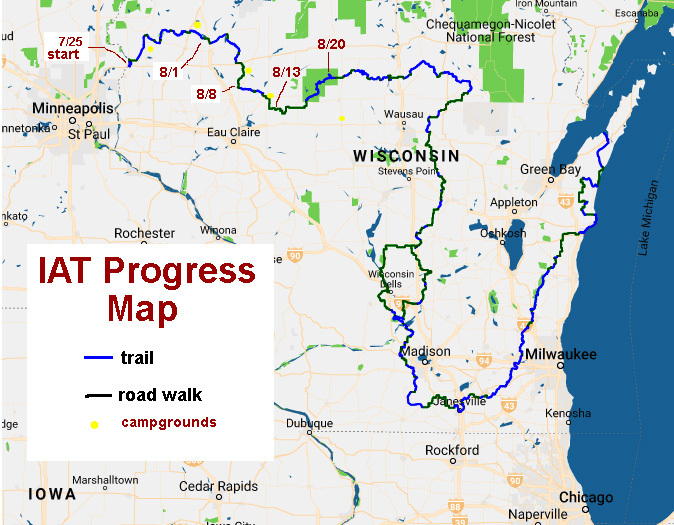 A lot of the first section was on the Gandy Dancer Rail Trail. It was an easy hike going thru some small towns. We had lunch at a couple of nice local restaurants. 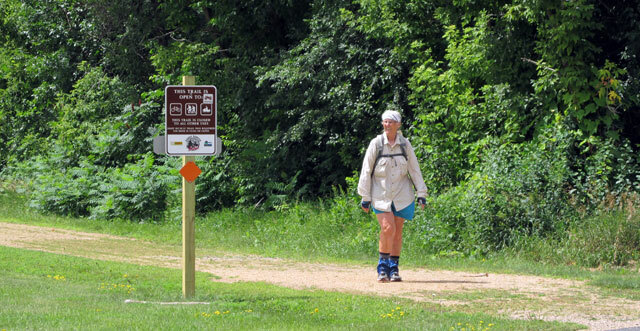 After the rail trail the next section was thru a ski trail section. 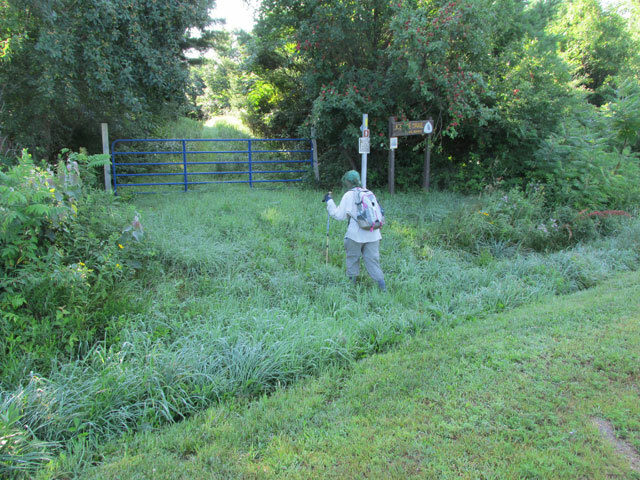 The grass was high and the bugs started. 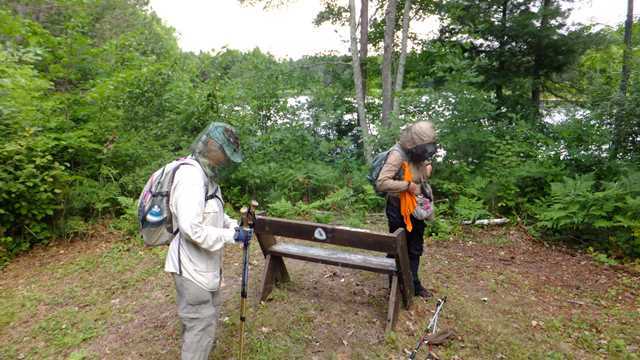 The mosquitoes were vicious!!! Headnets and long sleeves and pants were required. 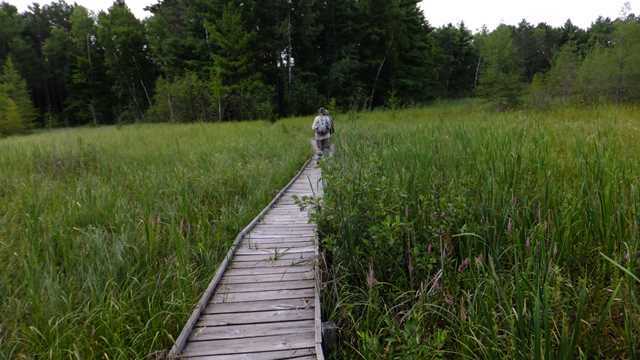 The trail went thru swamps, high grass and fields of wildflowers. 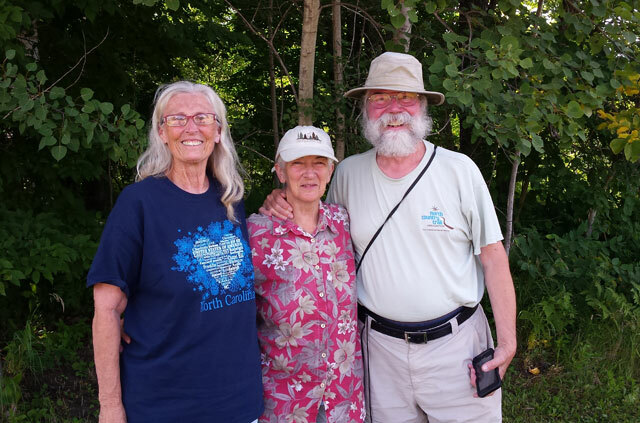 While at the Whitetail Ridge Campground outside of Serona, WI we met a couple from New York, Dan and Ruth, who were also hiking the trail. They were a couple of days ahead. 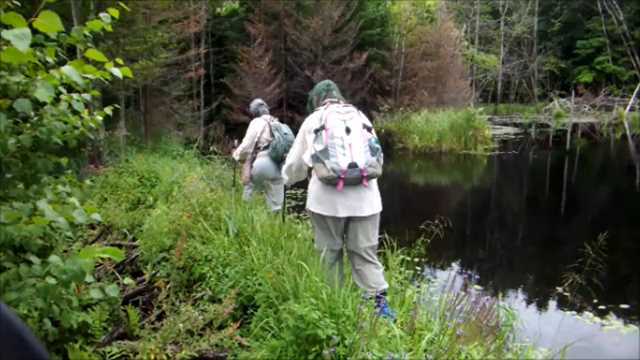 Since it would be a lot nicer to hike with someone Judy asked if she could hike with them. They agreed. We will go back later and pick up the 2 days she skipped. On 8/3 I was waiting to pickup the hikers after a road walk when I saw a storm headed their way. I drove back and asked if they wanted to stop early or get wet. They replied that they wanted to finish and they would get wet. I drove to the end (approx. 1.5 miles) and waited. In a couple of minutes I thought someone had hit the roof of the car with a hammer. 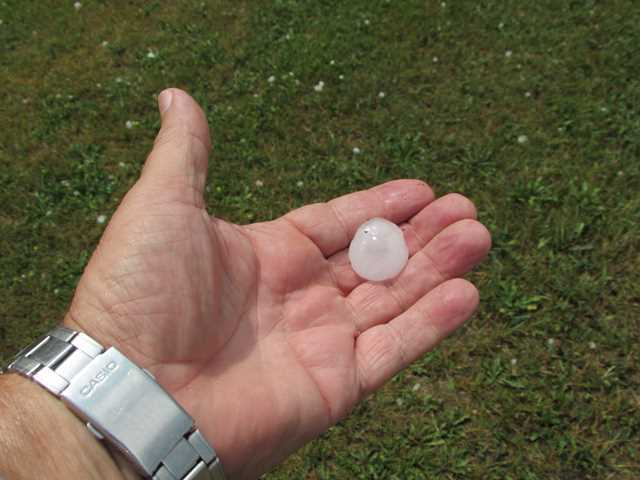 Hail started falling. 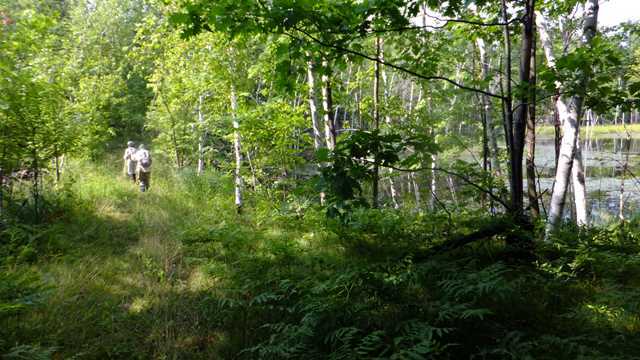 I quickly drove back to find them headed for a picnic shelter about 100 yards off the road. They jumped into the car just as the hail quit. Judy said it hurt when they hit her on the head. Luckily no one was hurt. I didn't see any dents then but a few days later I found 4 small dents in the hood of the car. 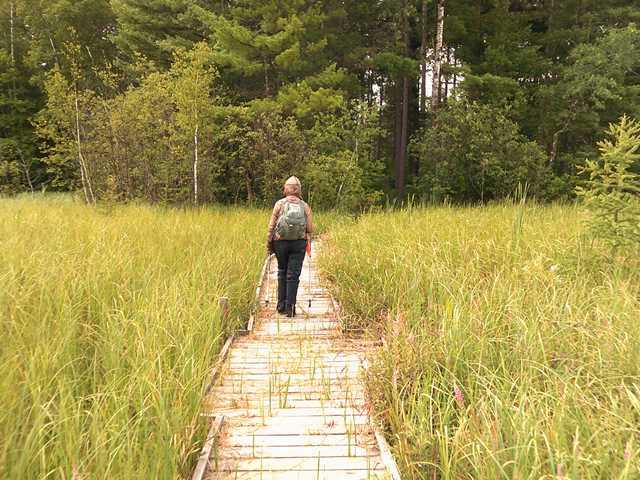 A bridge across a marsh area. 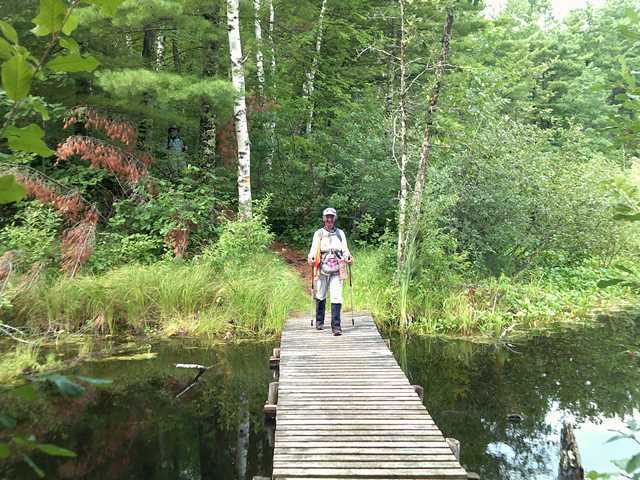 A bridge across a pond. 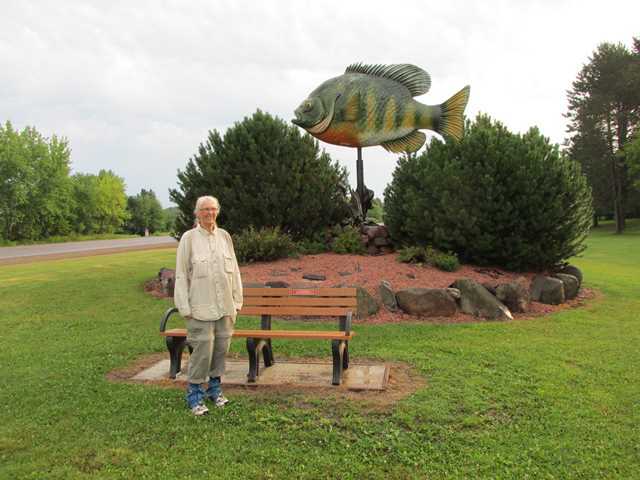 Judy with a large bluegill. The town says it is the bluegill capital of the world?? 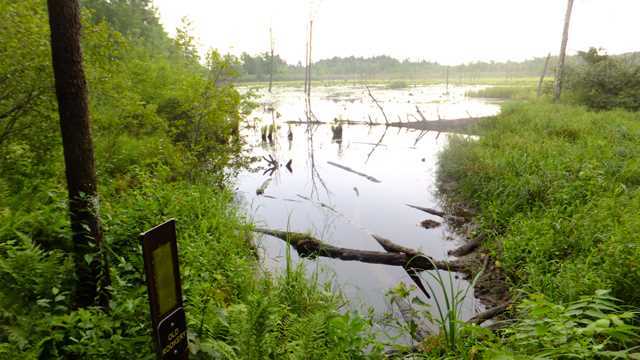 Another type of bridge..a beaver dam. 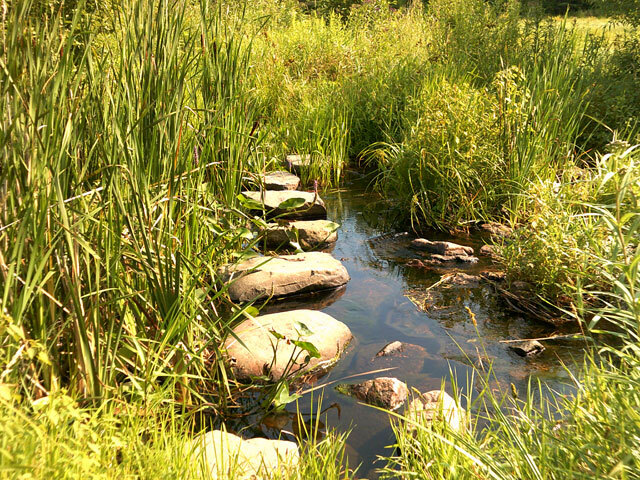 Judy says they are very good builders and the dams are really secure. Finishing up a road walk section. Notice no headnets. During a trip into town for lunch we stopped at an outdoor clothing store. Judy was looking for more long sleeved shirts to keep off the mosquitoes and couldn't find any. 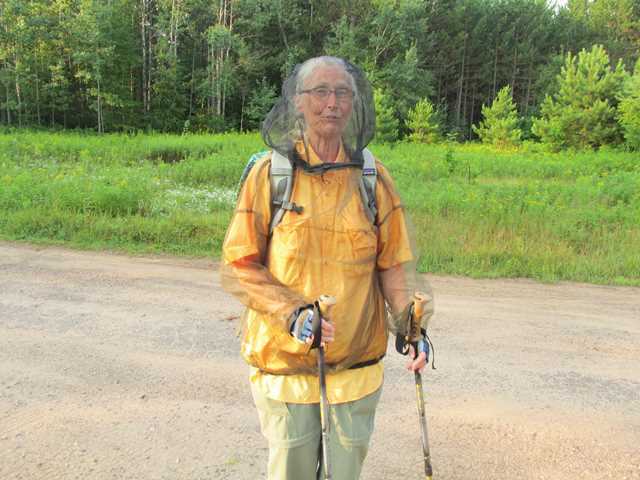 She instead bought a bug jacket with a built-in headnet. She didn't wear it too long. She said it blocked the air and was too hot. Break time at a leopold bench. 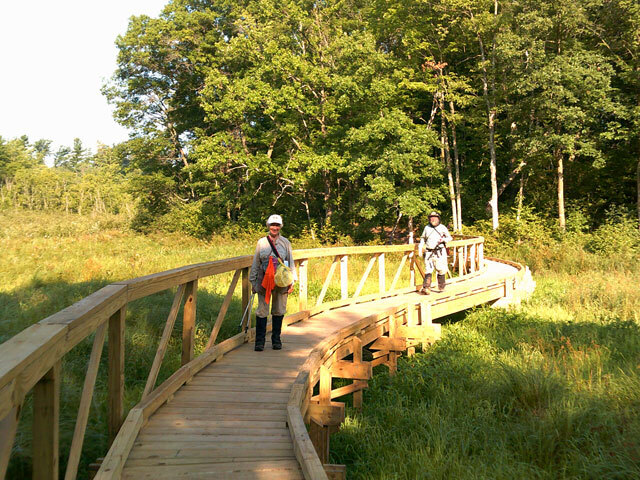 Another elevated walkway across a wetland. As the sign says..a rookery. They take a water break every 30 minutes. Ruth and Dan on a curvy bridge. 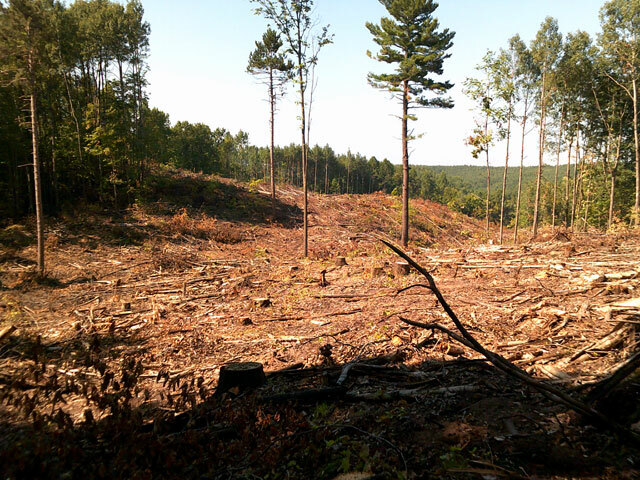 They had to detour around this logging area. 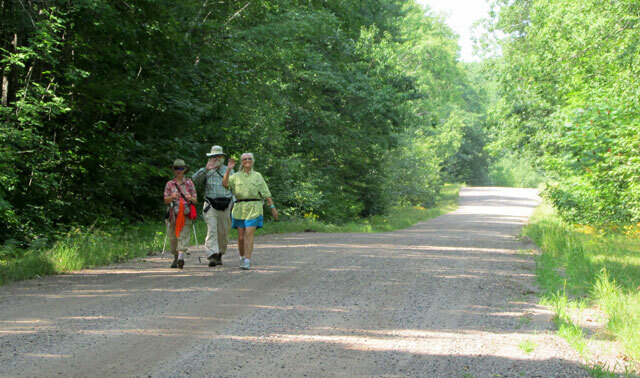 There was a 40 mile road walk which took several days to complete. Mostly boring but a few interesting sights. They passed by a hobbit house along the way. I drove by a forest of old chain saws. I estimated between 300 to 400 old saws were used to make this. 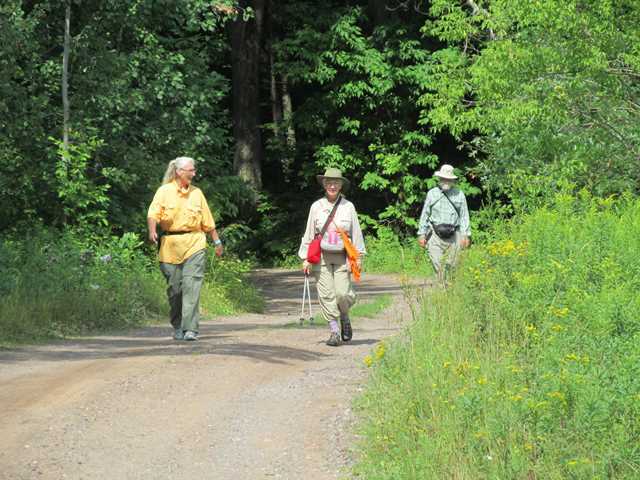 Then it was back into the woods at Chequamegon-Nicolet National Forest for several days. 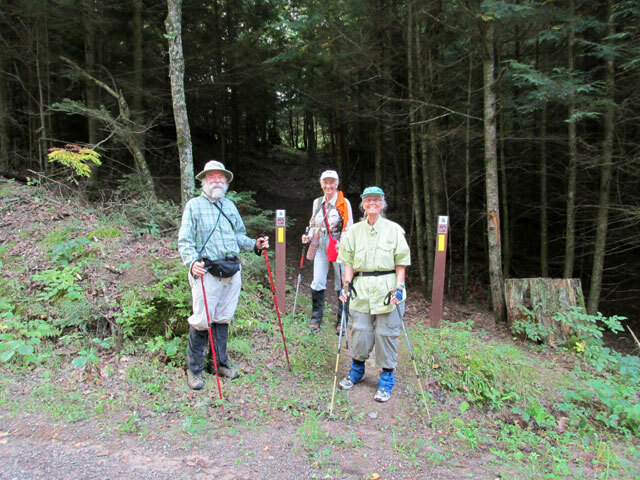 They finished hiking on 8/21 at the Mondeaux Dam Recreation Area. 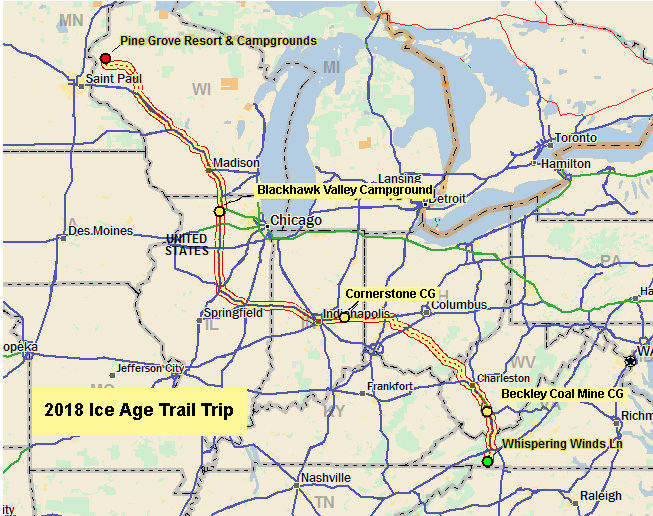 Total miles hiked this year is 258 according to the Ice age Trail APP but was measured at 277 miles by Dan and Ruth's GPS's. 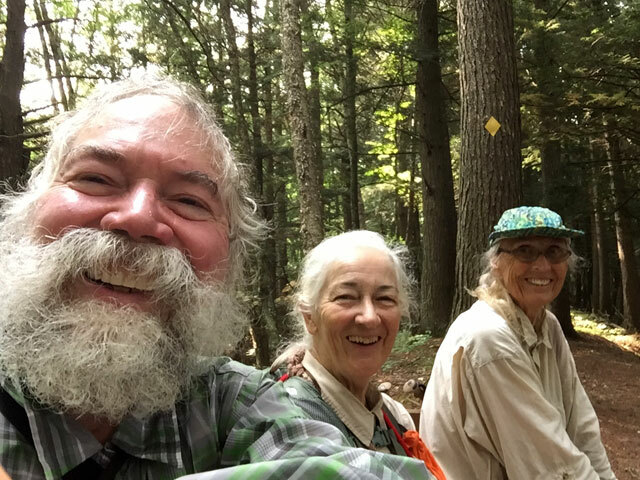 Hopefully there will be more trail adventures next year! !